You'll be £18.00 closer to your next £10.00 credit when you purchase Naval Anti-Aircraft Guns and Gunnery. What's this? 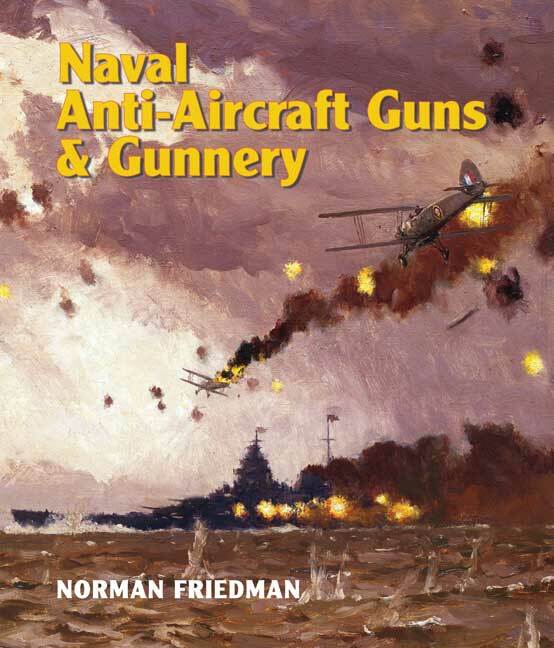 This book does for naval anti-aircraft defence what the author's Naval Firepower did for surface gunnery – it makes a highly complex but historically crucial subject accessible to the layman. It chronicles the growing aerial threat from its inception in the First World War and the response of each of the major navies down to the end of the Second, highlighting in particular the widely underestimated danger from dive-bombing. Central to this discussion is an analysis of what effective AA fire-control required, and how well each navy's systems actually worked. It also takes in the weapons themselves, how they were placed on ships, and how this reflected the tactical concepts of naval AA defence. As would be expected from any Friedman book, it offers striking insights – he argues, for example, that the Royal Navy, so often criticised for lack of 'air-mindedness', was actually the most alert to the threat, but that its systems were inadequate not because they were too primitive but because they tried to achieve too much. The book summarises the experience of WW2, particularly in theatres where the aerial danger was greatest, and a concluding chapter looks at post-1945 developments that drew on wartime lessons. All important guns, directors and electronics are represented in close-up photos and drawings, and lengthy appendices detail their technical data. It is, simply, another superb contribution to naval technical history by its leading exponent. This is a really massive work that covers in great detail, the means used by warships to shoot down attacking aircraft. It covers right from the very beginning of AA fire and details not only the weapons used, but the means of controlling them and the tactical doctrine of the navies using them. It is lavishly filled with photographs and illustrations and the discussion on means of controlling AA fire in various periods if very illuminating. I have re-read several sections because I found the contents not only interesting, but quite important to the understanding of how things worked...particularly in WW2. An AA weapon was not only as good as people using it and their training, it was also only as good as its control and director prediction of range, bearing, and where the target would be when AA fire arrived. I highly recommend this book, particularly to anyone writing wargames rules. I give it ***** five stars because it is not only full of fascinating information and detail, but because the author has made it very readable as well. Overall [this] is a magnificent volume, which no serious student of naval warfare should be without. No one, however good their previous knowledge, can read Naval Anti-Aircraft Guns and Gunnery without greatly improving their understanding of a form of warfare that was of key importance in the Second World War. The book is highly recommended as by far the best single source on the subject. Naval aerial warfare came to a prominence during World War 2 and this excellent volume details how a number of navies reacted to this threat. The book is well structured and the referencing, notes and bibliography are excellent. Seaforth and Norman Friedman have produced another monumental contribution to the technical history of 20th Century naval warfare. Overall, it is a magnificent volume, which no serious student of naval warfare should be without; no-one can read it without greatly improving their knowledge. There is therefore no excuse for not acquiring it. After a bit of a gap I am happy to have one of these impressive naval history books from Seaforth in front of me. As with the previous examples we’ve seen this one does not disappoint right from the beautiful cover showing Swordfish going to Valhalla during the Channel Dash. Now, I have to admit I am hardly well versed in the history or technicalities of naval anti-aircraft gunnery, so I’ll stick with the basics and report that the book looks at the development of the weaponry from the Great War up until the introduction of missile technology changed the face of naval warfare. We see the guns themselves and the rapid advances in the array of predictors, computers and radar devices which aided them to shoot enemy planes down. The book is not confined to the great capital ships and there is plenty of interest in smaller vessels including some of the impressed paddle steamers of the type my grandfather served on up until his death in 1941. One of the highpoints of his time on HMS Southsea was when her crew shot down a German bomber in 1940 and achieved prominence in the wartime press. The book looks predominantly at the British and American navies, but there is also much room for developments in Japan and the other Axis powers. This is one of those rare occasions when I admit I haven’t read the whole thing from cover to cover and, it’s true, the subject is a tad niche, but I find these books so attractive I am quite happy leafing through the pages to see stunning archive photography with extensive captions. This led me to read more extensively and I was struck by the sheer quality of the text. The book looks at the kind of weapons used against shipping by aircraft, which includes the early German guided weapons. Throughout its pages you can gauge how meticulous the author has been. All the important developments from better gun mounts to ammunition feeds and the really clever stuff, the radar and the predictor equipment are explained. Perhaps more than any other, this is the field which took the biggest leaps in quality as World War II progressed. Unlike the glorious reference works of ships great and small I like so much, this one is a lot more specific and is obviously based at the more specialist reader. But it is another example of how to produce the highest quality histories and reference works and if this is a field of interest to you, I would suggest the book is a must have. Every so often, a book is published that will prove the definitive work on its subject. This is such a book...and copies are likely to fly off the shelf for private and professional libraries around the world. A splendid book on naval weaponry. Magnificently illustrated with photographs and drawings throughout, this outstanding book is exceptional and will clearly be the essential reference source on naval anti-aircraft guns and gunnery. Most highly recommended for technical experts, naval historians and enthusiastic amateurs.